Dairy Products « Global Market Insights, Inc.
Food pathogen testing market has now evolved into one of those fraternities that mandatorily demands an excessive requirement for sanitation at every stage of production, thereby necessitating the requirement for highly efficient pathogen removal processes. Pathogen testing tools are quite prominently used across the food product manufacturing sectors – right from the pre-process of raw material testing to the manufacturing of the end-product. The evolution of pathogen testing methods has delivered multiple benefits to the food vertical, which would undeniably impel food pathogen testing industry size. Given that the prevalence of health risks associated with contaminated products may impact negatively on the business, food manufacturers have been taking utmost precautions to deploy efficient pathogen testing methodologies during production, thereby carving out a positive growth path for food pathogen testing market in the years ahead. For the record, estimates claim food pathogen testing industry to have held a revenue of USD 3 billion in 2016. The emergence of new technologies in food pathogen testing market has pushed the conventional pathogen test methods to next level. Considering the benefits of technological interventions, these advanced methods are being instantly accepted across the food and beverages industry. In North America, for instance, F&B sector behemoths have been giving high preference to pathogen testing methods pertaining to the growing use of genetically modified organisms and high medical expenses. 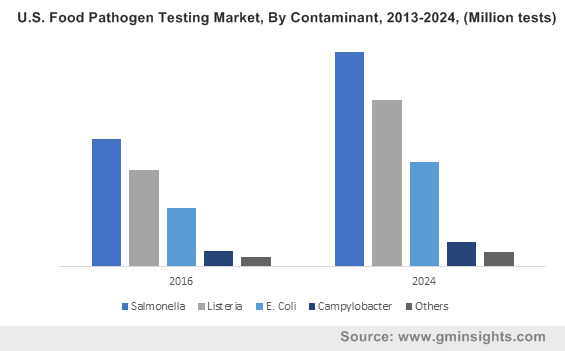 This may perhaps be one of the key factors augmenting North America food pathogen testing industry size, which, as per a report compiled by Global Market Insights, Inc., will collect a revenue of more than USD 2 billion by the end of 2024. Apart from the recent advancements prevalent in food pathogen detection, it has been observed that there are myriad opportunities and challenges to enhance the already existing technology in this business. Many players in food pathogen testing market though, prefer looking out for newer techniques and biosensors for food pathogen detection. Client partnerships with pathogen testing service providers are commonplace in food pathogen testing industry, to avoid product contamination. For instance, SGS, a leading verification, inspection, certification, and testing company plans to provide its services to the pet-food manufacturers in United States and Canada with regards to Salmonella contamination, to prevent health risks in pets. For the record though, in 2016, food pathogen testing industry size from salmonella contamination was valued at USD 1.2 billion. This may be attributed to the increase in the number of food borne diseases, subject to the presence of Salmonella in food products. Similar to SGS, many other prominent players in food pathogen testing market such as Bureau Veritas, SGS, Eurofins Scientific, RapidBio Systems, Inc.™, Intertek, Lloyd’s Register Quality Assurance, Inc., Det Norske Veritas, Genon Laboratories Ltd., and Microbac Laboratories have been observed to undertake efforts with regards to innovating novel pathogen testing methods. Taking into account the risks associated with foodborne diseases, the regulatory bodies of various countries have been enforcing strict norms to mandate the deployment of pathogen testing methods. In the U.S., Food and Drug Administration has formed the Food Safety Modernization Act (FSMA) to enhance the food safety system for public health protection. With the FSMA, FDA has also been able to collaborate with other domestic as well as foreign government agencies to build integrated food safety systems, which will prompt other governmental bodies to adopt food pathogen testing techniques, inherently propelling food pathogen testing market. The governmental bodies across the Asia Pacific are strongly focusing on extensive research and development activities, owing to the rapid growth of the chemical and food processing sectors in the region. In addition, food pathogen testing industry players, having established their bases in the APAC belt, have also been striving to expand their reach across the frontiers and strengthen their customer pool. Recently, for example, Thermo Fisher Scientific Inc. acquired a leading contract development and manufacturing company, Patheon N.V., which has helped the former expand its customer base across the biotechnology and pharmaceutical sectors. These growth strategies are evidence enough to prove food pathogen testing market is likely to carve out a lucrative growth path in the years ahead. This entry was posted in FOOD, NUTRITION AND ANIMAL FEED and tagged Campylobacter, Convenience, Dairy Products, E. Coli, Food Pathogen Testing Market, Food Pathogen Testing Market Size, Food Safety Testing Market, Fruits, Immunoassay, Listeria, Meat, PCR, Poultry, Processed Food, Rapid, Salmonella, Traditional, Vegetables.